Alien Tool. Melee weapon attack: +3 to hit, reach 5 ft., one target. Hit: 3 (1d4 + 1) bludgeoning damage. Multiattack. The alien crewman makes two attacks. Alien Disintegrator. Ranged weapon attack: +6 to hit, range 40/120 ft., one target. Hit: 17 (4d6 + 3) energy damage. Alien Atomizer. Ranged weapon attack: +6 to hit, range 60/180 ft., one target. Hit: 12 (2d8 + 3) energy damage. Alien Shock Baton. Melee weapon attack: +6 to hit, reach 5 ft., one target. Hit: 6 (1d6 + 3) bludgeoning damage and 4 (1d8) electrical damage. Multiattack. The alien ensign makes three attacks. Alien Disintegrator. Ranged weapon attack: +8 to hit, range 40/120 ft., one target. Hit: 18 (4d6 + 4) energy damage. Alien Atomizer. Ranged weapon attack: +8 to hit, range 60/180 ft., one target. Hit: 14 (2d8 + 4) energy damage. Alien Shock Baton. Melee weapon attack: +8 to hit, reach 5 ft., one target. Hit: 7 (1d6 + 4) bludgeoning damage and 4 (1d8) electrical damage. Multiattack. The alien lieutenant makes four attacks. Alien Disintegrator. Ranged weapon attack: +9 to hit, range 40/120 ft., one target. Hit: 18 (4d6 + 4) energy damage. Alien Atomizer. Ranged weapon attack: +9 to hit, range 60/180 ft., one target. Hit: 14 (2d8 + 4) energy damage. Alien Shock Baton. Melee weapon attack: +9 to hit, reach 5 ft., one target. Hit: 7 (1d6 + 4) bludgeoning damage and 4 (1d8) electrical damage. Mark I. Inertia Suppression Field. The alien lieutenant commander has a personal force field which protects the alien from most damage types. The inertia suppression field reduces the damage of attacks against the alien by 10. The following damage types disrupt the shield or ignore it, and therefore are not subject to damage reduction from it: cold, electrical, fire, and radiation. When a source of damage deals more than one damage type, apply the damage reduction against the damage types which the field resists, then roll any damage dice that bypass the inertia suppression field remaining damage types as normal. Multiattack. The alien lieutenant makes five attacks. Alien Disintegrator. Ranged weapon attack: +10 to hit, range 40/120 ft., one target. Hit: 18 (4d6 + 4) energy damage. Alien Atomizer. Ranged weapon attack: +10 to hit, range 60/180 ft., one target. Hit: 14 (2d8 + 4) energy damage. Alien Shock Baton. Melee weapon attack: +10 to hit, reach 5 ft., one target. Hit: 7 (1d6 + 4) bludgeoning damage and 4 (1d8) electrical damage. Mark II. Inertia Suppression Field. 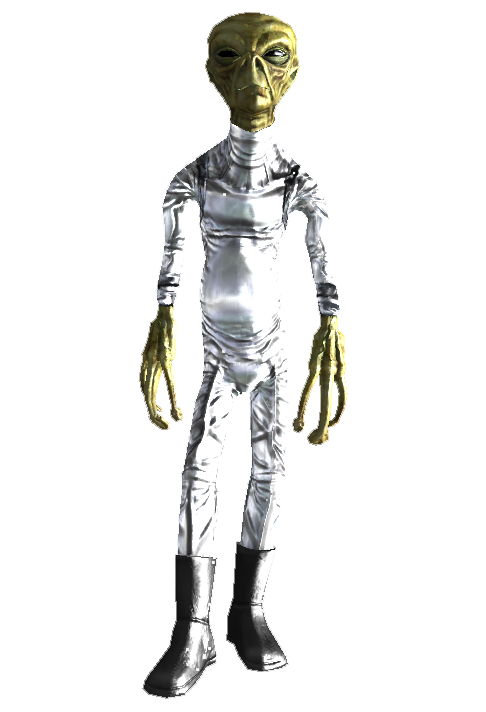 The alien commander has a personal force field which protects the alien from most damage types. The inertia suppression field reduces the damage of attacks against the alien by 15. The following damage types disrupt the shield or ignore it, and therefore are not subject to damage reduction from it: cold, electrical, fire, and radiation. When a source of damage deals more than one damage type, apply the damage reduction against the damage types which the field resists, then roll any damage dice that bypass the inertia suppression field remaining damage types as normal. Multiattack. The alien lieutenant commander makes six attacks. Alien Disintegrator. Ranged weapon attack: +11 to hit, range 40/120 ft., one target. Hit: 18 (4d6 + 4) energy damage. Alien Atomizer. Ranged weapon attack: +11 to hit, range 60/180 ft., one target. Hit: 14 (2d8 + 4) energy damage. Alien Shock Baton. Melee weapon attack: +11 to hit, reach 5 ft., one target. Hit: 7 (1d6 + 4) bludgeoning damage and 4 (1d8) electrical damage. Mark III. Inertia Suppression Field. The alien captain has a personal force field which protects the alien from most damage types. The inertia suppression field reduces the damage of attacks against the alien by 20. The following damage types disrupt the shield or ignore it, and therefore are not subject to damage reduction from it: cold, electrical, fire, and radiation. When a source of damage deals more than one damage type, apply the damage reduction against the damage types which the field resists, then roll any damage dice that bypass the inertia suppression field remaining damage types as normal. Multiattack. The alien captain makes six attacks. Captain's Sidearm. Ranged weapon attack: +12 to hit, range 40/120 ft., one target. Hit: 22 (4d8 + 4) energy damage. Alien Shock Baton. Melee weapon attack: +12 to hit, reach 5 ft., one target. Hit: 7 (1d6 + 4) bludgeoning damage and 4 (1d8) electrical damage. Languages Understands Zetan but cannot speak. Machine. The support drone is immune to poison, radiation and all forms of disease. It does not need to eat or sleep, but enters an inactive state for at least 4 hours a day to conserve power. The support drone cannot use stimpaks or other items intended for biological creatures. Multiattack. The support drone makes two attacks. Bash. Melee weapon attack: +5 to hit, reach 5 ft., one target. Hit: 5 (1d6 + 2) bludgeoning damage. Machine. The guardian drone is immune to poison, radiation and all forms of disease. It does not need to eat or sleep, but enters an inactive state for at least 4 hours a day to conserve power. 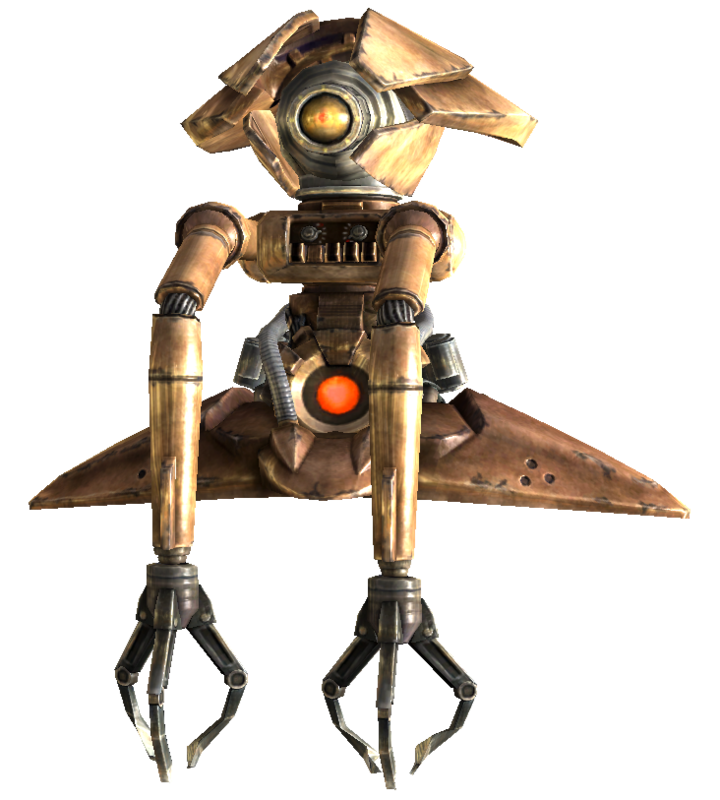 The guardian drone cannot use stimpaks or other items intended for biological creatures. Drone Cannon. Ranged weapon attack: +6 to hit, range 60/180 ft., one target. 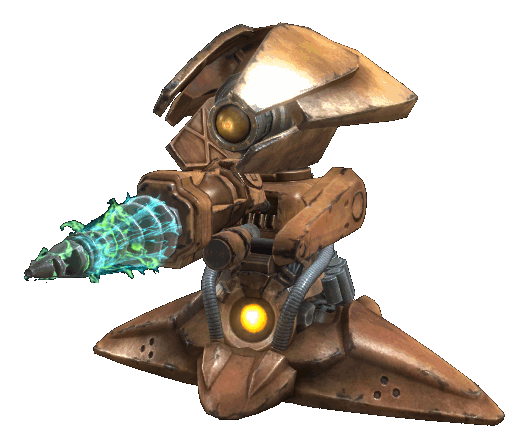 Special: The guardian drone chooses any target within range and makes an attack roll against a DC of 10, or 15 if the target is in long range. If the drone fires at a target behind cover, apply the cover bonus that usually applies to a target’s AC to the DC. If the attack roll is lower than the DC, the cannon's energy ball lands 5 feet away from the original target for every 1 by which the drone’s result fell short, in a randomly determined direction (assign compass directions to a d8). All creatures within 10 feet of the point of impact must make a DC 15 Dexterity saving throw. On a failed saving throw, a creature takes 35 (10d6) energy damage, or half that on a success. Machine. The experimental weapons drone is immune to poison, radiation and all forms of disease. It does not need to eat or sleep, but enters an inactive state for at least 4 hours a day to conserve power. 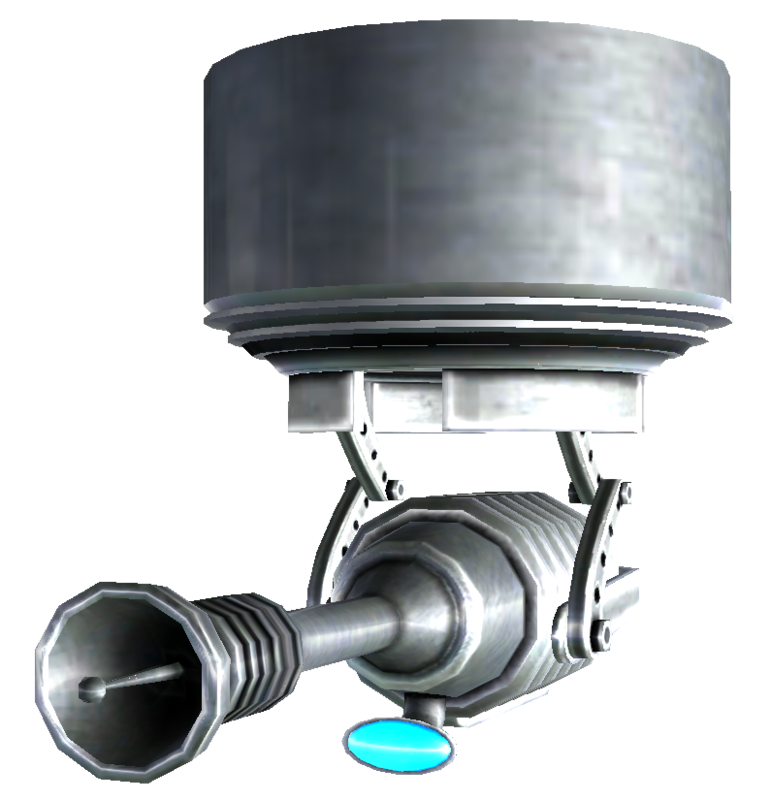 The experimental weapons drone cannot use stimpaks or other items intended for biological creatures. Drone Cannon Ex-B. Ranged weapon attack: +6 to hit, range 100/300 ft., one target. Special: The experimental weapons drone chooses any target within range and makes an attack roll against a DC of 10, or 15 if the target is in long range. If the drone fires at a target behind cover, apply the cover bonus that usually applies to a target’s AC to the DC. Track Target. The turret adds its Wisdom bonus to its attack and damage rolls. Energy Blasts. Ranged weapon attack: +4 to hit, range 90/270 ft., one target. Hit: 24 (4d10 + 2) energy damage.